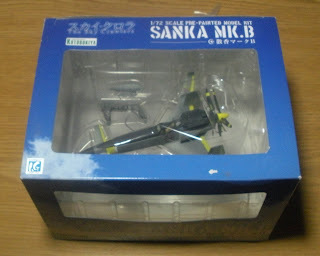 The Sanka B is the J7W Shinden look-alike from Mamoru Oshii's film, The Sky Crawlers. I purchased this pre-made model (Kotobukiya AM-05) at AX back in July, and have finally decided to put the thing together. The anime is visually stunning, and there are some excellent dogfighting scenes, but like most of Oshii's animated films, it left me rather cold. 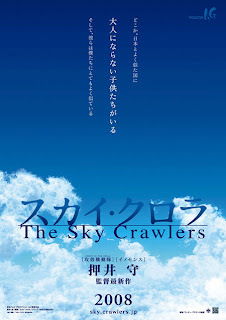 The film is a criticism of modern existence with the dark philosophical overtones typical of Oshii's works, but I was practically dozing throughout most of the film. Frankly, I don't think animation is a very good medium for what he wants to accomplish. Anyway, enough film criticism, and on to the model. 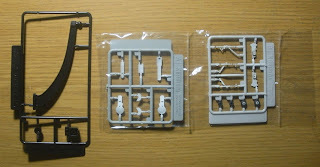 The model comes with three sprues of parts. A flight stand in black plastic, and sprues with gear bay doors supplied in wheels up and wheels down configurations. 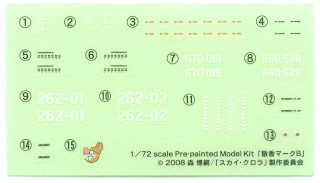 It also comes with two sets of identical decals. Markings are for the aircraft of Yūichi Kannami and Naofumi Tokino. I decided to display the model in the wheels down position. The wheels and bay doors were glued to the struts even though they fit fairly well without glue. The wheels will need a bit of touch up paint after being clipped from the sprue. 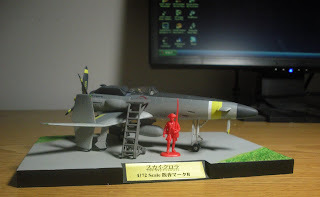 Some other pieces included are a separate drop tank, base, and boarding ladder. All in all, a nice little model. 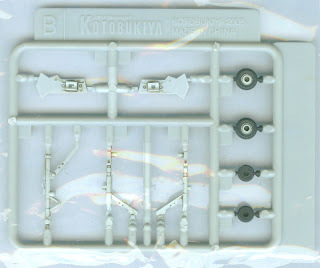 I'll have to find one of the discontinued Bandai versions to build up as well.